There are certain foods that can be associated with seasons. With the fall season here and the holidays will be soon arriving, the fruit pumpkin comes to mind. Pumpkins are believed to have originated in North America. Seeds from related plants have been found in Mexico dating back to 7000 to 5500 B.C. References to pumpkins date back many centuries. The name pumpkin originated from the Greek word for “large melon” which is “pepon.” “Pepon” was changed by the French into “pompon.” The English changed “pompon” to “Pumpion.” American colonists changed “pumpion” into “pumpkin.” Native Americans dried strips of pumpkin and wove them into mats. They also roasted long strips of pumpkin on the open fire and ate them. The origin of pumpkin pie occurred when the colonists sliced off the pumpkin top, removed the seeds, and then filled the insides with milk, spices and honey which was then baked in hot ashes of a dying fire. Seeing that bright orange color of a pumpkin is a giveaway that pumpkin is loaded with an important antioxidant, called beta-carotene. Beta-carotene is one of the plant carotenoids converted to vitamin A in the body and can be found in fruits, vegetable and whole grains. In the conversion to vitamin A, beta carotene performs many important functions in overall health. Vitamin A is needed for good vision and eye health, for a strong immune system, and for healthy skin and mucus membranes. The antioxidant properties of beta-carotene are disease fighting which helps protects the body from damaging molecules called free radicals. Nutritionally, one cup of cooked, boiled, drained, without salt pumpkin includes: 49 calories, 2 grams of protein, 12 grams of carbohydrate, and 3 grams of dietary fiber. 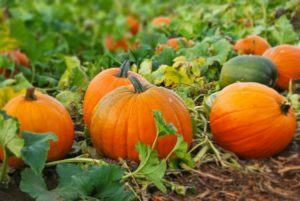 One serving of pumpkin also has many vitamins and minerals in it like vitamin C, niacin, folate, vitamin A, and vitamin E, calcium, iron, magnesium, potassium, zinc, and selenium. It is fat free, and cholesterol free food. When buying pumpkins, select pumpkins that are firm and heavy for their size. Store pumpkins in a cool, dark place. Pumpkin seeds can be roasted and used as a snack or added on top of salads. Pumpkins are used to make soups, pies, muffins and breads. Add roasted pumpkin cubes to green salads or quinoa salad. Make a pumpkin parfait. Layer low-fat vanilla yogurt or low-fat plain Greek yogurt with pumpkin purée and low-fat granola for a quick and delicious snack. Add a pinch of cinnamon and nutmeg. Stuff a pumpkin. Remove the top and seeds of a pumpkin. Then mix diced apples, pineapple and raisins with cinnamon, and nutmeg. Fill the pumpkin with mixture, replace top and bake on a baking sheet for 1 hour 350°F. Scoop sides of pumpkin down into the apple mixture and serve. Make a pumpkin-banana shake with 1 cup plain low fat or nonfat yogurt, 1 cup of cooked or canned pumpkin, 1 sliced banana and 2 drops of Vanilla extract. Blend until smooth. Make a pumpkin spread with two packages of low fat or nonfat cream cheese (softened), 1/2 cup Splenda, 1 can pumpkin, 1/2 to 1 teaspoon ginger and 1 teaspoon cinnamon. Mix cream cheese and sugar together in mixer or bowl. Add pumpkin and spices and blend well. Spread on a 100 % whole wheat English muffin or bagel. Pumpkin & Squash. Roast or sauté diced pumpkin with diced squash and/or sweet potatoes. Add a touch of cayenne pepper. Try oat bran muesli with pumpkin. Use ½ cup oat bran, 1 cup rolled oats, 1 cup plain low fat or nonfat yogurt, and 1/4 cup unsalted pumpkin seeds. Use sliced oranges or berries. In a medium-sized bowl, stir together oat bran, oats and yogurt. Place mixture in a container, cover and refrigerate overnight. Serve in a bowl, mix in the seeds or sprinkle them on top, along with the fruit.